Located on the eastern face of 4,003 foot Mt. 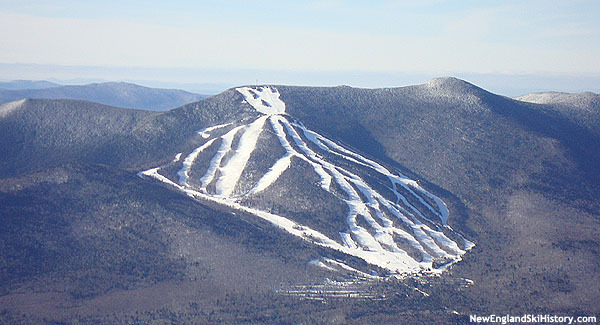 Tecumseh, Waterville Valley ski area has been one of the best known ski areas in New England for nearly half a century. Organized skiing on Mt. Tecumseh dates back to 1934, when the first Mt. Tecumseh CCC ski trail cut. Three years later, a second version of the trail was cut, crossing through the present day ski area. The first trail was abandoned circa 1940, while the second trail became a popular place to race. Many well-known racers competed on the Mt. Tecumseh Trail in the 1940s, including a young Tom Corcoran. Circa 1940, there was a proposal to build a lift on the second Mt. Tecumseh Trail. Not much is known about this proposal, but it was eventually rejected by the United States Forest Service. Mt. Tecumseh would wait a quarter of a century before its next serious ski lift proposal. Meanwhile, across the valley from Mt. Tecumseh the Waterville Inn was looking to attract skier visitors. Circa 1941, Edward Romeo opened a rope tow near the inn. 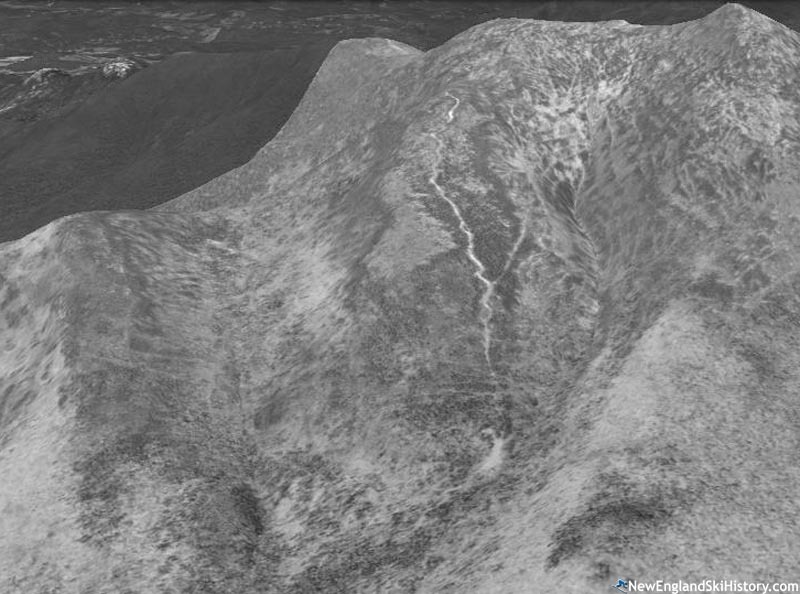 Sometimes known as Waterville Valley ski area, this development would eventually become Snow's Mountain. As the 1960s unfolded, Waterville Valley was in danger of being wiped off the map. In 1962, the last annual Tecumseh race was held, as lift served ski areas dethroned hike up, ski down trails. By the middle of the decade, Waterville Valley had only 22 residents remaining. Meanwhile, Interstate 93 was expanding north to the White Mountains. 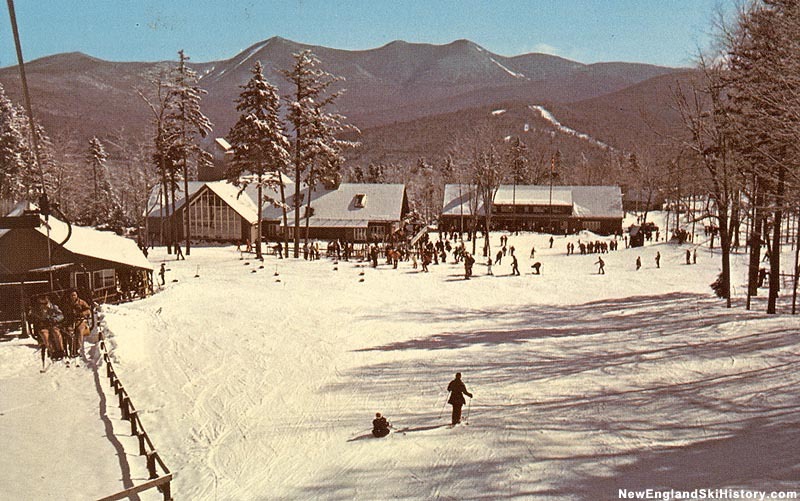 Circa 1964, Ralph Bean was telling people that he was ready to sell the Waterville Inn, its small ski area, and about 400 acres of privately held land. Looking to develop a ski area somewhere in the northeast, Olympic skier Tom Corcoran began working with Sel Hannah's Sno Engineering, which also happened to be working with Bean. After being flown around Waterville Valley by Sno Engineering's Ted Farwell, Corcoran found his mountain. When a prospective sale to a group from Rhode Island fell through, Bean struck a deal with Corcoran, forming a new firm to handle the development called the Waterville Company. Corcoran also allegedly sought the help of a friend, Senator Robert F. Kennedy, to help procure financing and permits. In February of 1966, clearing commenced for the Corcoran and Sel Hannah designed trail network. In April, Corcoran revived the old fashioned Tecumseh race. Surrounded by freshly cut trails, well known skiers such as Corcoran, his wife Birdie, George Macomber, Bobo Sheehan, Natalie Kate White, Walter Prager, and Hannah. 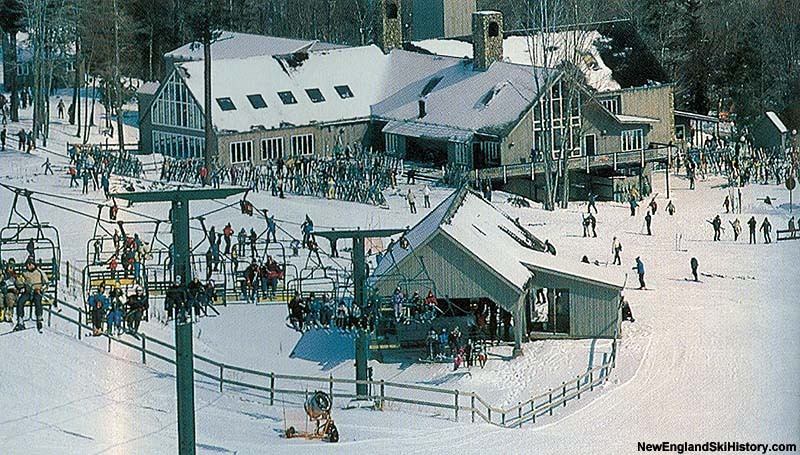 The estimated $2.5 million development opened for the 1966-67 season as one of the largest ski areas in New England. The lift network was composed of four Stadeli double chairlifts spanning some 2,000 vertical feet along with a novice J-Bar. In addition to two large buildings in the base area, the Birds Nest was constructed near the top of the main double chairlift. A large snowmaking system was installed, ensuring operations in lean years. The former Waterville Inn ski area was renamed Snow's Mountain and used as an overflow facility. Soon after the opening of the ski area in December, the Kennedys made headlines by flying into Laconia and travelling up to Waterville Valley for a ski vacation. The entourage included Senator Ted Kennedy, Sargent Shriver, Stephen Smith, and their families. Sadly, the historic Waterville Inn burned down in February. Nevertheless, the first season was a success, lasting until April 30th on the High Country. For the second season, work was done on the two base lodges and a racing T-Bar was installed. Meanwhile, more lodging and dining facilities were added in the valley. On June 5, 1968, Waterville Valley advocate and skier Senator Robert F. Kennedy was assassinated while campaigning in California. That winter, Corcoran opened "Bobby's Run," which was dedicated to his late friend. In addition, Waterville Valley rose to international fame when it hosted the final World Cup races of the season. Despite warm March weather, the races were successfully held in honor of Senator Kennedy. Ethel Kennedy and John F. Kennedy Jr. were in attendance. 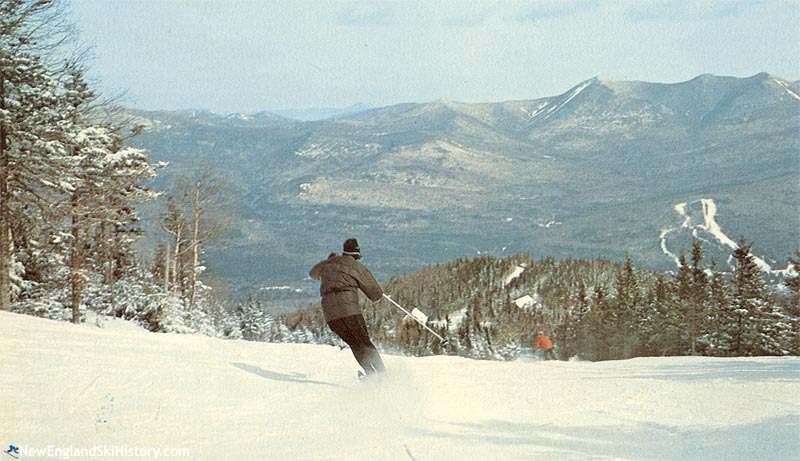 The Sunnyside Area, including Bobby's Run, opened with a new double chairlift for the 1969-70 season, giving Waterville a legitimate expert complex. 1977 saw a sizable investment of $1.2 million in the ski area. Nearly half a million dollars was spent rebuilding the snowmaking system top to bottom, while a similar amount was spent on improvements to the buildings at the Sunnyside and main base areas. Most noticeable of all was the addition of a triple chairlift on the Valley Run and clearing of new trails. Two years later, the Sunnyside chairlift was upgraded from a double to a triple. In the fall of 1979, Tom Corcoran purchased the bankrupt Bobcat ski area and merged it with Crotched Mountain. Corcoran would leave the ownership of that group in the 1980s. In 1981, Corcoran renamed the Birds Nest to the Schwendi Hut in honor of 10th Mountain Division veteran Walter Prager, who was originally from Switzerland. Following lean snow years, Waterville Valley expanded its snowmaking coverage to 130 acres by 1982. For the 1982-83 season, the Northside double chairlift was installed, providing an upper elevation lift that would play into early season snowmaking trail rollouts. Uphill capacity was further addressed for the 1985-86 season, when a new triple chairlift was installed on the main mountain. In October of 1986, the Tax Reform Act of 1986 was signed, resulting in a change in deductions for real estate investments. Unfortunately for Waterville Valley, this happened while they were developing Town Square and the Golden Eagle. Seemingly overnight, the pre-sales in new development dropped from 100% to 10%. 1988-89 saw two drastic changes at Waterville. For the first time, snowboarders were allowed on the mountain, paving the way to a future focus on terrain parks. Secondly, New Hampshire's first high speed detachable quad was installed. 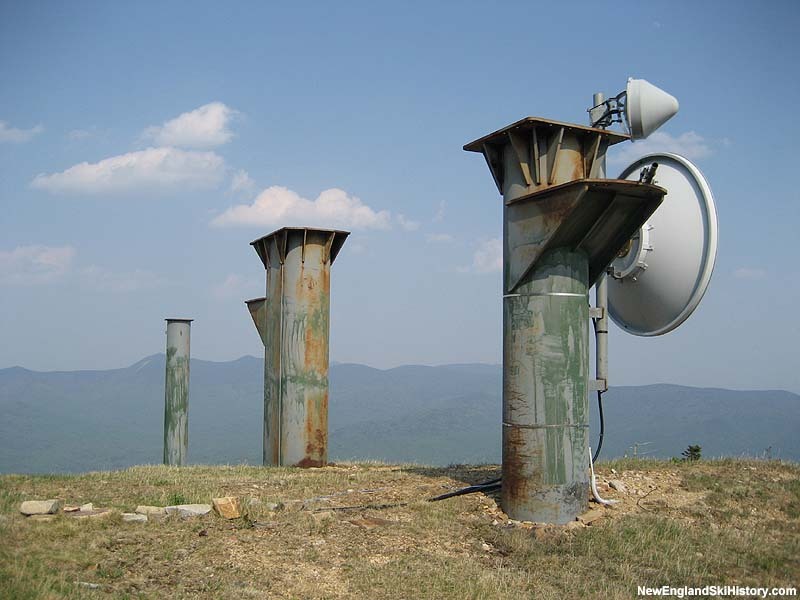 Initially a top to bottom installation, significant clearing in the High Country resulted in severe wind exposure, often closing the lift. Eight years later, the lift was shortened to terminate at the bottom of the High Country. In 1991, Waterville's two main lenders, East Bank and Dartmouth Bank, failed. The Federal Deposit Insurance Corporation took on their debt and immediately applied pressure on Waterville Valley. Corcoran attempted to bring in new investors to help defuse the problem. In 1993, Merv Griffin's Griffin Group placed two of its executives on the Waterville Company Board of Directors. While Waterville's balance sheet was in reasonable shape and its debt reduced since the bank failures, the FDIC situation prevented the company from getting its normal seasonal working capital in 1994. As a result, the Waterville Company filed for Chapter 11 bankruptcy protection while seeking a buyer. 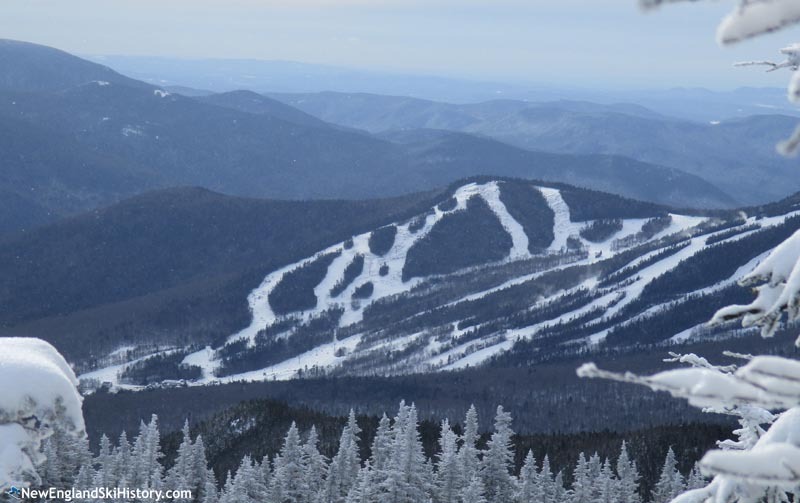 On October 31, 1994, S-K-I Ltd. purchased the ski areas from the Waterville Company for $10,037,631. Corcoran's Waterville Company retained its real estate, conference and sports centers, and undeveloped land. At the time, Corcoran stated, "after 30 years of looking out the window to see what burned down the night before, it's time for someone else to experience those joys," adding, "in the last three years I got so badly beaten up by the banks, this is kind of a relief." Waterville's tenure under S-K-I Ltd. would be short lived, as it was rolled into American Skiing Company following the 1995-96 season. Due to anti-trust concerns, the ownership was forced to sell Waterville and Cranmore. Pursuant to the Justice Department order, American Skiing Company sold Cranmore and Waterville Valley to Booth Creek Ski Holdings, Inc. for $17.2 million on November 27, 1996. The new arrangement worked out well initially, as the new ownership installed Waterville's second high speed detachable quad chairlift for the 1997-98 season. Soon thereafter, Loon was added to the Booth Creek portfolio, creating a powerful Waterville-Loon-Cranmore "Threedom Pass." Unfortunately, Booth Creek had financial problems of its own, resulting in stagnation at Waterville as the seasons passed. After over a decade of ownership, Booth Creek sold Waterville Valley to a group of investors, including John Sununu, on October 8, 2010. The new owners immediately began significant work on deferred maintenance with Bob Fries returning to the role of General Manager. In 2011, two related expansion proposals emerged. The decades old vision of connecting downtown Waterville Valley to the ski area was put back on the table, as a Village Gondola was formally proposed. The gondola would connect to new terrain on Green Peak. The Green Peak proposal was approved by the White Mountain National Forest Supervisor on June 21, 2013. In the spring of 2013, Bob Fries stepped down and future Governor Chris Sununu took over as General Manager. Initial Green Peak clearing commenced in the spring of 2015 when Tim Smith was promoted to General Manager. Wide scale work on Green Peak began in late August 2016, resulting in the clearing of all approved trails, a temporary snowmaking infrastructure, and the installation of a chairlift to the top of the peak. Trails on lower Green Peak debuted on January 14, 2017, followed by the Green Peak Triple on February 11. Waterville Valley unveiled its next capital investment program in 2017, dubbed Phase II. A wide variety of projects were started that off season, including permanent snowmaking on Green Peak, base lodge renovations, replacement of the Pasture J-Bar and High Country Double, and a large scale snowmaking expansion.